Mayo swatted away the challenge of Limerick with ease in the Gaelic Grounds on Saturday evening going home with a 18 point win against their hosts. Stephen Rochford’s men hit the back of the net five times, with four of those coming in a clinical second half performance where they bagged 5-9 in the closing 35 minutes. Cillian O’Connor returned to start his first game for a number of months and he finished off the day with 3-9 to his name and in the process marched to the top of the all time scoring charts for the county. It was the Treaty men who started the game brightest with Sean McSweeny rattling the back of David Clarke’s net from the penalty spot three minutes in after Danny Neville had been fouled. Any hope that Limerick might have had of building on that lead was quickly quashed as Mayo took control of the game with O’Connor kicking four points in-a-row before the 15th minute to put Mayo in front. James Durcan who came into the starting line-up for his first ever championship start alongside Cian Hanley tagged on Mayo’s fifth of the day not long after and from there on in there was only ever going to be one winner. Aidan O’Shea slotted over his first of the evening after he won a throw-ball, after Limerick keeper Donal O’Sullivan had been blown up for taking to long on his restart to move Mayo to the half-a-dozen. Limerick did manage to tag on the next score after Iain Corbett made a darting run, through the middle of the Mayo defence, but it was only a light touch of the glove that was never going to rock Mayo. O’Connor slipped over his fifth of the day 22 minutes in and then seven minutes later he rattled home his first goal. The Ballintubber man flicked a dropping ball into the path of Evan Regan with his boot - and the Ballina man fed it back to O’Connor to finish from close range. Chris Barrett popped up to slot over Mayo’s eighth point and then Colm Boyle added on one more, before O’Connor finished the scoring with a free to send Mayo in leading 1-10 to 1-1 at the break. Just like in the first half, Limerick were the first to strike on the scoreboard with Jamie Lee slipping one between the posts. But points in quick succession form O’Shea, O’Connor and Regan made sure it was never going to be a contest on the scoreboard in the second half. The game ticked with Mayo cruising - until Limerick struck their second goal when Seamus O’Donnell got in behind Keith Higgins and was able to slot the ball under Clarke. 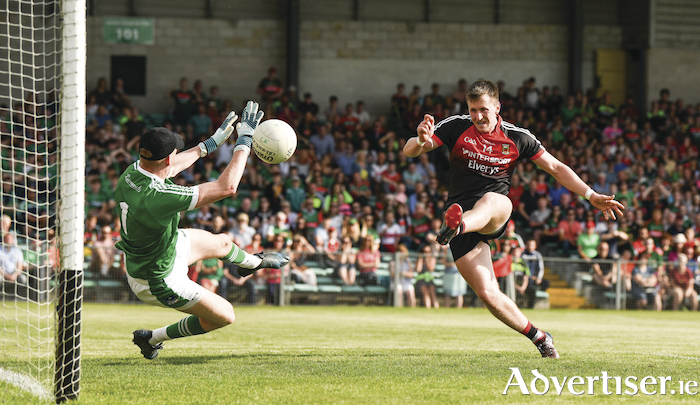 Mayo didst panic and between the 62nd and 65th minute they reeled off three goals on the bounce, two going to O’Connor and the other to Andy Moran who had just come into the fray. Moran went on to grab another goal before the end for Mayo and the hosts also netted another major when O’Carroll slammed home an injury time penalty. But it was of no consequence to the scoreboard at the end of the day as Mayo march on into round two of the qualifier draw on Monday morning. Mayo: C O’Connor (3-9, 0-5 frees, 0-1’ 45 ); A Moran (2-0 ); P Durcan, A O’Shea (0-2 each ); C Boyle, C Barrett, S Coen, C Hanley, E Regan, J Durcan (0-1 each ). Limerick: S O’Carroll (2-1, 1-0 pen, 0-1 free ); S McSweeney (1-0 pen ); J Ryan (0-2 frees ), I Corbett (0-2 each ); D Neville, J Lee (0-1 each ). Mayo: D Clarke; C Barrett, G Cafferkey, K Higgins; E O’Donoghue, P Durcan, C Boyle; S O’Shea, S Coen; K McLoughlin, A O’Shea, C Hanley; E Regan, C O’Connor, J Durcan. Subs: L Keegan for Boyle (46 mins ); J Doherty for McLoughlin (48 ); C Loftus for S O’Shea (53 ); A Moran for Higgins (54 ); C Crowe for Hanley (60 ); S Nally for O’Donoghue (64 ). Limerick: D O’Sullivan; G Noonan, S O’Dea, P Maher; P White, I Corbett, C Fahy; D Treacy, M Fitzgibbon; S McSweeney, D Neville, J Liston; P Nash, J Ryan, J Lee. Subs: S O’Carroll for McSweeney (HT ); T McCarthy for Liston (48 ); P Scanlon for Lee (53 ); G Browne for Fitzgibbon (57 ); D Lyons for Neville (61 ); D Connolly for Nash (66 ). Referee: N Cullen (Fermanagh ).